The wire used is a soft copper or aluminum; try to get wire that is about one third the thickness of the branch to be bent. 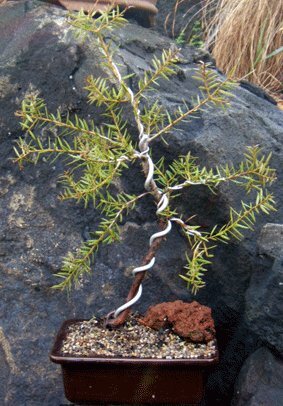 Wire stripped from electrical cable is perfectly adequate but if you can't find any, you may have to contact your local bonsai nursery. 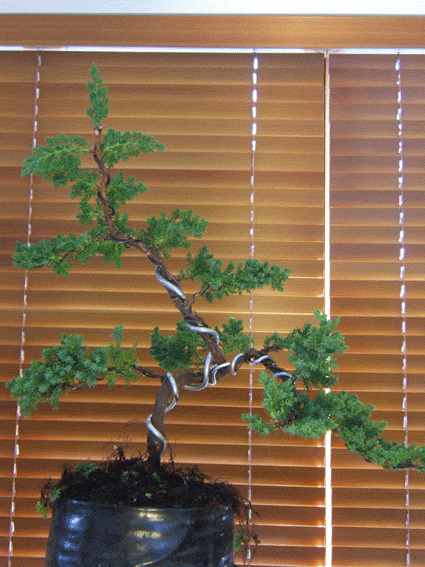 The trick with wiring is to make sure that one end is anchored properly; you can achieve this by pushing one end into the soil if bending the trunk or wiring two branches at the same time. Practice on a branch you have removed or on a near by tree before you start on your tree. The turns of the wire should be kept at an angle of 45 degrees and quite firm against the branch, be careful not to tear the bark or worse, snap your branch. Go slowly and keep it tidy, people will be looking at it for a few months before you can remove it. The length of time you leave it on will vary depending on the type of tree and the time of the year. Keep a close eye on it and when it starts to look too tight, cut it off. If the branch springs back, it will need rewiring. Don't leave the wire so long that it cuts grooves into the bark. With your tree all wired and roughly to the shape you require its time to pot. 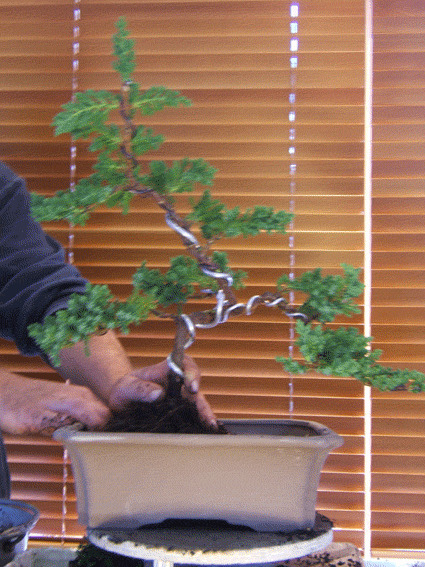 The pot is an important part of the whole bonsai process it can make or break your design. Use a proper bonsai pot they should have quite large drainage holes and some kind of feet to lift the base off the ground. As well as these two horticultural requirements this is a piece of art you're creating so the pot should be part of your overall design. 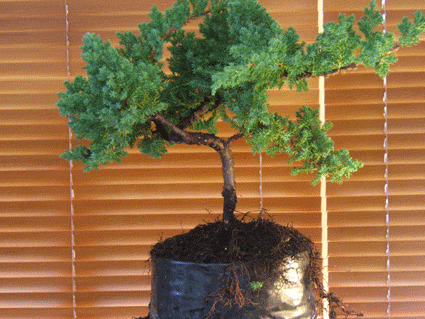 This is a new bonsai and as such still has some maturing to do don't try to put it in too small a pot. It will continue growing and you can always down size once some new root is established. 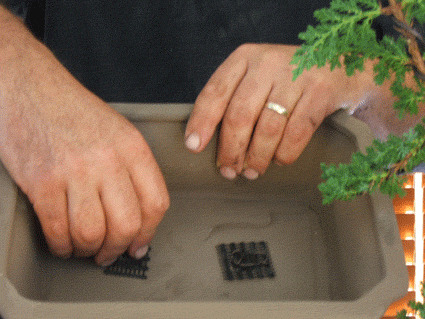 Mix four parts potting mix that you can obtain from your nursery with one part small sharp stone. This improves drainage and helps the roots to divide. You can in some places buy a ready made Bonsai mix. Remove your tree from its existing pot and check the roots, look for bugs or rot. Loosen the soil with a root hook or a bent fork. Tease out the roots and remove any large thick roots. People seem to think the tap root is important at this stage, if you are working on nursery stock you are unlikely to find one they will only be present on seed grown stock and usually die when they hit the bottom of the pot anyway. The tap root is for anchoring the tree to the ground and has little to do with feeding the plant so if perchance it is there remove it. Only remove as much root as needed to fit into your new pot. Place small pieces of mesh over the holes in your pot, this stops soil coming out and bugs moving in. Fill the bottom of the pot with a layer of soil and place your plant on top, try to place it off centre and towards the back if possible. 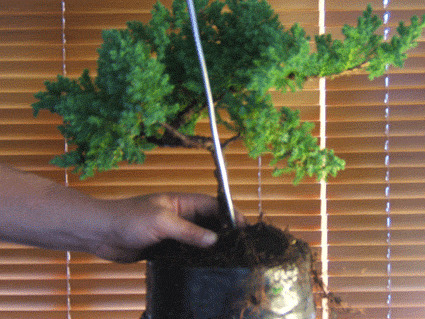 Pack soil around the plant, you may need to use a twig or chop stick to push soil around the roots. Cover the soil with a fine stone, the stone used in your soil mix would be fine. This looks nice and stops the water washing the soil away. Watering. A good method for this first watering is to immerse the entire pot in water until all the soil is covered leave it there until the bubbles stop. This makes sure that all the gaps in the soil are filled and no roots are left to dry out. 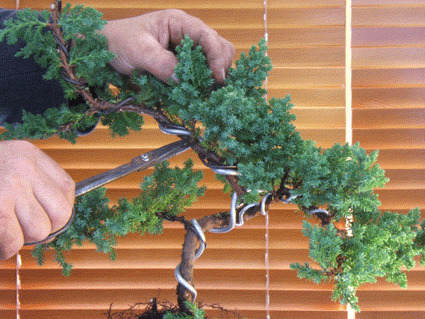 With the front of your tree decided upon you can start trimming away any parts that are not part of your finished Bonsai. Easier said that done. If you do it in small stages it becomes clearer as you go along, start by removing anything that is diseased or dead. If you have picked your tree carefully there should be very little to do here. Then move on to removing anything that is growing down from the bottom of a branch. Don't remove any branches until this is done, it will thin out your tree and allow you to see the branch placement more clearly. Remove any small growth comming directly from the trunk and anything that you are obviously not going to use in your final design. To prepare your pot, place the mesh over the drainage holes. Don't try to use a very small pot. Keep the pot quite large for a new Bonsai. 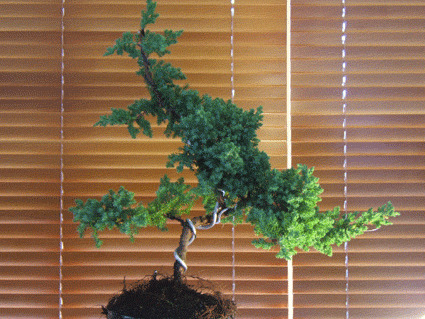 This tree has not had time to produce the fine feeder roots that are required to keep a bonsai healthy in a small pot. If you wish to reduce the size of you pot you can do it on your next repot in a years time. Trim off any excess roots. 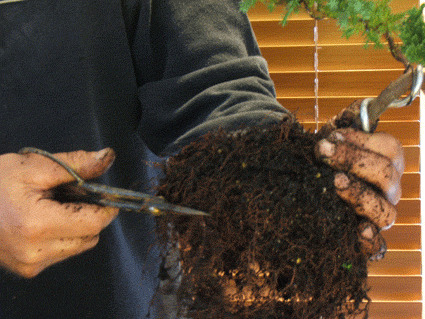 Roots to remove would be damaged roots or very thick roots that may prevent the tree being potted. Don't go over board, retain as much root as possible.